What is a Desk Extension Elbow Pad Armrest used for? While working at a large display computer on a narrow desk, it helps alleviate eye fatigue by lengthening the distance from the screen to your body. For long hours of using computer, it supports your cantilever elbows as a desk extender, relieving the pressure and tension on wrists and forearms and making keyboard typing relaxed. In addition, no stressful friction between forearms and the desk helps keep both of them clean. Easy to use - Portable and installed simply. Unscrew to attach to desks, adjustable to desks up to 2.2 inches thick. High quality - Durable aluminum alloy brackets stretchable to 12 inches, strong plastic pad with soft surface cushion upon, supporting up to 24 lbs and relieving 90% of the weight undertaken by your elbows. Ergonomically Designed - Moved freely with both right hand and left hand, offering an enough wide range of motion to adjust for any sitting posture. Health Care - Alleviate strain and pain of eyes, shoulders, wrists, and neck areas caused by long-term use of computer and long hours staring at the screen, helping prevent carpal tunnel syndrome from developing. Particularly developed for heavy computer users, such as IT professionals, designers, office employees and etc. For Lift Adjustable Style: Adjustable vertically higher than the desk to comfort elbows in different postures. For Normal Style: Not adjustable in height, the elbow pad after installed is as high as the top of the desk. Adjust the armrests in adapt to the most comfortable posture before use. Be kind of yourself and order yours now! 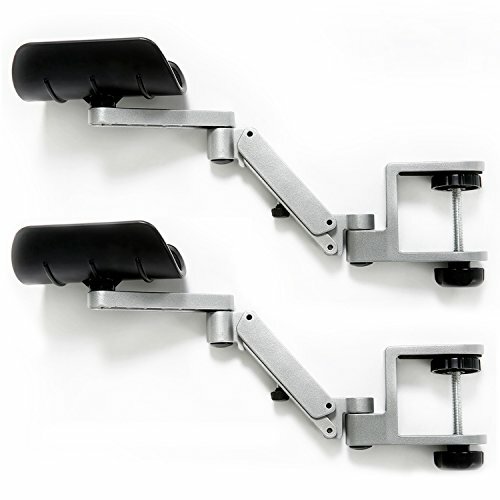 High quality - Durable aluminum alloy brackets stretchable to 12 inches at maximum extension, strong plastic pad with soft surface cushion upon, supporting up to 24 lbs and relieving 90% of the weight undertaken by your elbows. Ergonomically Designed - One of the brackets is 180 degree rotatable for horizontal adjustments, the other bracket and the elbow pad are 360 degree rotatable. Moved freely with both right hand and left hand, offering an enough wide range of motion to adjust for any sitting posture. Health Care - Alleviate strain and pain of eyes, shoulders, wrists, and neck areas caused by long-term use of computer and long hours staring at the screen, helping prevent carpal tunnel syndrome from developing. Particularly developed for heavy computer users, such as IT professionals, designers, office employees and etc. If you have any questions about this product by patu, contact us by completing and submitting the form below. If you are looking for a specif part number, please include it with your message.